A tractor-trailer carrying millions of honeybees overturned on a highway north of Seattle early Friday, scattering hives and sending white-suited beekeepers scrambling to save as many insects as they could. 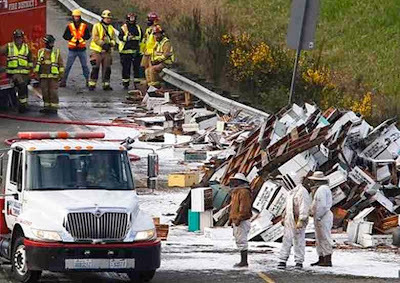 The truck had just merged onto Interstate 5 around 3:30 a.m. when it tipped on its side, dumping its load of 448 hives, or about 13.7 million bees, Washington State Patrol Trooper Travis Shearer said. The driver, a 36-year-old man from Idaho, was not hurt. The company that owns the insects, Belleville Honey and Beekeeping Supply of Burlington, sent beekeepers to recover as many as possible, and bees covered their protective suits as they worked. The bees became more active as the sun rose and the weather warmed, and firefighters had to spray a layer of foam on some of the boxes, killing the insects for safety. Reportedly, all the first responders and reporters got stung. Watched it on local TV.